It’s Monday! What Are You Reading? 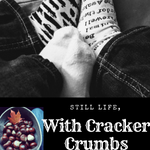 | Still Life, With Cracker Crumbs..
Brrr…I am feeling cold just reading about your chilly days!! It’s great that you had a warm room and TV to watch. Thanks for sharing, and for visiting my blog. Enjoy this week, and may it be warmer. It was pretty cold! We were even made to turn our heat down to 65 or they were thinking the gas supply would run out. It was horrid. Lol. But we made it! 🙂 We just got all hygge. That’s insanely cold. I can’t even begin to imagine how awful -50 is! Is Hometown the one that takes place in Laurel, MS? I pass through. there every month or so when I go visit family. There’s a lovely bakery but other than that it is not my favorite town! The show is pretty interesting though. I can see why you didn’t get much reading done. I have a 9 year old so he doesn’t need nearly as much attention as a littler one yet when he is home I get no reading done! Have a great week! I don’t even want to know how cold it was outside either! Lol. I never even stepped a toe out there. My husband did though, and said he was very grateful for heated seats and steering wheel. Lol. It is!!! And that is a great fact to know! I think it is interesting that their entire show is just houses from that town, but I guess good for them for trying to build it up. Hopefully the rest of the town catches up! It was quite a week, wasn’t it? Wow. Glad that’s over- although it was pretty, all the snow, and now with the rain and warmer temps it’s all slushy and yucky. Ha ha. But I won’t miss it either- they called off school over here the WHOLE week, the highways were a mess… ugh. Ugh it was the worst!! Then having to turn our heat down too, what the heck! Did you guys have to do that too? They were using gas reserves from our county to supply another one, I was paranoid we were going to run out. I kept my heat down but when Wyatt started coughing I turned it back up a bit. 😦 The week was rough – and now freezing rain tomorrow too! And yes, now everything is a brown mudbog. Lol. Yes we had to turn ours down too. We got the alert over the TV and I was like seriously? What is this the beginning of the apocalypse lol? Then we saw the news that there was a fire or something… I was glad to turn it up a few days later cause it got COLD in here! OMGoodness, that negative temperature was whacked! We Bay Area natives are freezing when it’s in the 30’s LOL. Thank goodness for books and hoorah for a change in weather where you were able to get out and about afterwards.